Real Madrid won the last game they had scheduled to play in American soil, after beating Inter Milan with a scathing 3-0. 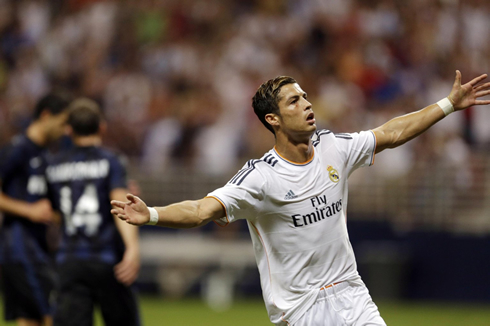 Kaká, Cristiano Ronaldo and Ricardo Alvarez (own goal), secured the victory for the Merengues in an emphatic way. The Portuguese forward reached his 6th goal of the pre-season, from a powerful strike deep in the first half. The Merengues extended their winning streak last night in Saint-Louis, in a 3-0 win against Inter Milan. Ancelotti's men didn't have many problems to get past the Italian side, which has clearly seen better days in a very recent past. Cristiano Ronaldo only played the first half but still managed to get his usual goal and with it, he helped Real Madrid imposing their law against the "Nerazurri". The Merengues will now start preparing their kickoff in "La Liga", in a match that will be held at the Santiago Bernabéu, next Sunday (August 18). In the meantime, Ronaldo is expected to join the Portuguese National Team for a friendly match against Holland, next Wednesday. After going forward with the same line-up for two straight games, Carlo Ancelotti decided to do some changes to the team and give opportunity to a few players who haven't been getting much playing time thus far in the pre-season. Casemiro for example, was given a chance to show his value right from the start and the Brazilian quite simply didn't waste it. The Merengues midfield performed at a very high level this Saturday night and the 21-year old ended up confirming why he is being widely regarded as the revelation player of this year's Real Madrid pre-season. The first goal took place around the 11th minute of the first half, after a great long pass made by Angel Di María and to which Kaká responded with a great finish. The Argentinian continues showing off his great assisting skills and this time it was up to Kaká to stick the ball in the back of the net. The former AC Milan midfielder started by controlling the ball with his chest, just before striking it a few instants later. Handanovic made a great first stop, but the ball bounced just in front of him and allowed Kaká to get a second chance to head it to the far post. The Nerazzurri never seemed capable of matching Real Madrid's high-quality football on the pitch and we can't say that it came off as a big surprise when we saw the Merengues extending the lead near the 38th minute of the first half. Casemiro found Cristiano Ronado making a move forward by sending through a great pass and the Portuguese forward finished it off in a way that would make some of the greatest strikers in the game somewhat jealous about the technique, control and power displayed on the shot. Being two goals up, Real Madrid controlled and dominated most of the remaining time of the game. The Merengues would still reach a third goal later in the second half, in a moment when Ronaldo had already came off to give his place to Jesé. A well taken corner kick on the right attacking side led to a mistimed exit from Inter Milan's goalkeeper and an even more serious mistake by Ricky Álvarez, who ended up heading it to the back of his team's own net. Casemiro was right behind him to put some pressure on the Argentinian defender and it ended up paying off. With this win, Real Madrid closed their pre-season campaign with an almost perfect record of 7 games, 6 wins and 1 draw. The level of the opponents the Merengues have faced in the past few weeks was significantly high though, which naturally leads to a very positive valuation when assessing Carlo Ancelotti's first steps at the club. Real Madrid will now set the focus on their first official game of the season, as they'll have to host Betis in the Santiago Bernabéu next August 18, in La Liga's Matchday 1. 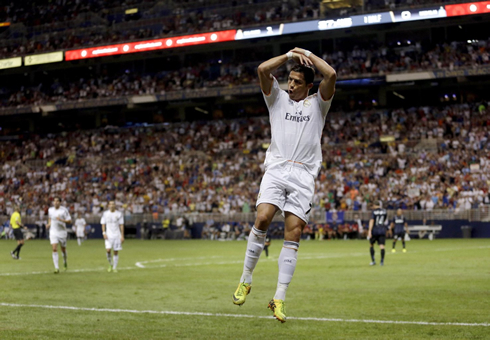 Cristiano Ronaldo next game for Real Madrid will be against Betis, this next Sunday (August 18, 2013). In the meantime, you can watch Real Madrid vs Betis, Malaysia vs Barcelona, Manchester United vs Wigan and Liverpool vs Celtic, all matches provided from our live football section.